In the 1960s, for example, nearly 95 percent of babies were born to couples who were married. Today, 40 percent are born to women who are either single or living with a non-married partner. The “typical” American family has changed radically over the last 50 years. American’s today are marrying later than ever before, divorcing sooner or avoiding the institution altogether. 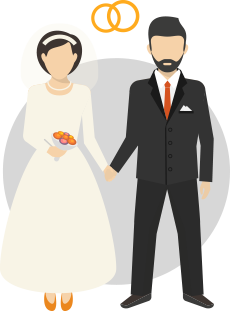 Whereas married couples dominated the family structure in years past, only 30 percent of millennials feel that a successful marriage is an important part of life. As a result of this institutional erosion, more and more children are being born out of wedlock. In the 1960s, for example, nearly 95 percent of babies were born to couples who were married. Today, 40 percent are born to women who are either single or living with a non-married partner. Often lost in the discussion of marital decline is a simple fact. Marriage is good for children. In fact, countless studies have shown that children born to married parents enjoy a number of socioeconomic benefits over those born to single parents. Here are some important facts you should know. Today, only about 64 percent of children live in homes with two parents who are married, representing an all-time low (Pew Research Center). 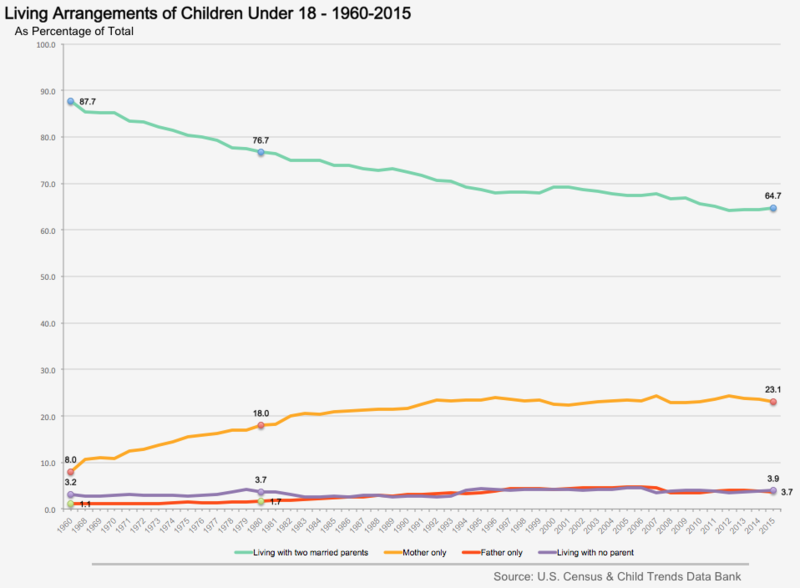 Trend data shows a stark and steady decline since 1960, when nearly 88 percent of children lived with married parents. 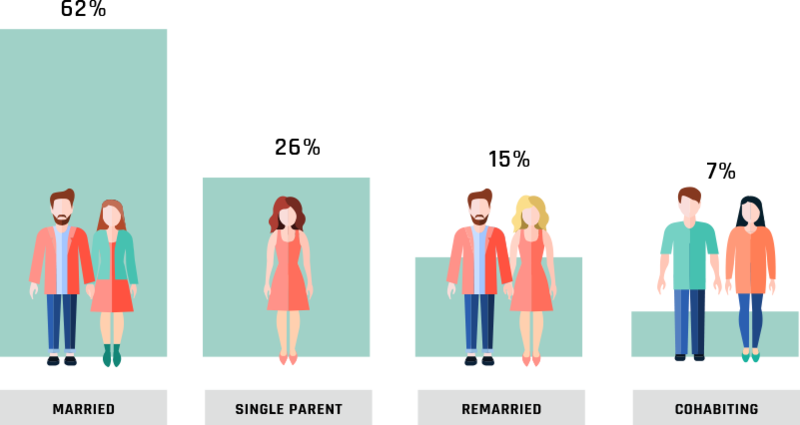 Fifteen percent of children today are living with parents who are remarried, and seven percent are living with cohabiting parents, while 26 percent are living with one parent only. 1. A solid, intact family structure can have a significantly positive impact on a child’s present and future wellbeing and offers countless benefits for both adults and children. 2. Children growing up in homes where two parents who have been married continuously are less likely to experience a wide range of problems (academic, social, emotional, cognitive), not only in childhood but later on in adulthood as well (Amato; Howard & Reeves,). 3. 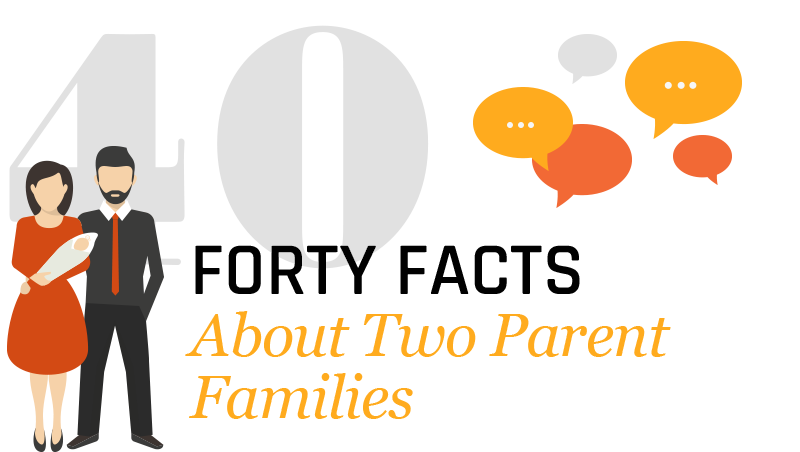 In two parent families, for example, children typically have access to more of the economic and community resources because parents are able to pool their time, money and energy; children tend to be more of the focus of the home. 4. Family intactness has also been shown to have a consistently positive influence on earnings for prime-age males and is one of the most important factors (or shared the place of greatest importance) for females and children in determining an area’s dependence on welfare programs that targets poverty. 5. Research also shows that family intactness has a beneficial influence on reducing out of wedlock births, increasing high school and college graduation rates, and even has long-term benefits such as higher employment rates. 6. Children living with married parents are more often involved in community activities such as soccer or other sports, take part in academic pursuits in local schools and other academic institutions that can lead to college, and eventually, a career. 8. Overall, intact families tend to be more stable; parents tend to be more involved in their children’s lives and are more highly invested in their children’s success. 9. Fathers of intact families spend, on average, more time with their children. They also enjoy greater family cohesion than peers with adopted children or stepchildren (Lansford, et al.). In summary, children living with both biological parents in a low-conflict marriage tend to do better on a host of outcomes than those living in step-parent families. 10. Children living with both biological parents are 20 to 35 percent more physically healthy than children from broken homes (Dawson). 11. Research shows that family structure is related to preschool children’s cognitive development skills. For example, a study by Kinard and Reinherz found that children from two parent homes had higher scores on verbal reasoning than those from single parent homes. 12. A study by Ginther and Pollack found that children growing up in intact families (traditional nuclear families) were more likely to graduate from high school and complete college compared to those who were raised in blended or single-parent homes. 13. Manning and Lamb found that adolescents in intact families had higher levels of academic achievement and were less likely to exhibit problem behaviors in school compared to peers living in homes where single mothers lived alone or with a cohabiting partner. 14. Following divorce, children are 50 percent more likely to develop health problems than two parent families. 15. In homes with stepfathers, peers were more likely to have been suspended or expelled from school, more likely to have engaged in delinquent behavior, to have problems getting along with teachers, doing homework, paying attention in school, and have lower grade point averages than those living in intact homes. 16. Children of divorce are at a greater risk of experiencing injury, headaches, speech defects, and other health concerns than children whose parents have remained married (Dawson). 18. Being raised in a married family reduced a child’s probability of living in poverty by about 82 percent. 19. The decline in two parent families has accounted for the three-fold increase in single parent homes, most often headed by single moms. 20. According to Pew Research, over half (57 percent) of those living with married parents were in households with incomes at least 200% above the poverty line, compared with just 21 percent of those living in single-parent households. 21. According to the U.S. Census, the poverty rate for single parents with children in the United States in 2009 was 37.1 percent. The rate for married couples with children was 6.8 percent. Rector called marriage one of the greatest weapons against child poverty. 1. According to the CDC, 4 out every 10 children are born to unwed mothers. Nearly two-thirds are born to mothers under the age of 30. 2. Today 1 in 4 children under the age of 18 – a total of about 17.4 million – are being raised without a father and nearly half (45 percent) live below the poverty line (U.S. Census Bureau). 3. Unmarried mothers generally have lower incomes, lower education levels, and are more likely to be dependent on welfare assistance compared with married mothers (Child Trends Data Bank). 4. Around 49 percent of single mothers have never married, 51 percent are either divorced, separated or widowed. Half have one child, 30 percent have two. 5. Single mothers are more likely to be poor than married couples. 6. Single mothers earn income that place them well below married mothers in the income ladder. The gap between the two groups is significant. 7. The median income for families led by a single mother in 2013 was about $26,000, one third (⅓) the median for married couple families ($84,000). Nearly half of single mother households had an annual income of less than $25,000. 8. Single mothers often spend over half of their income on housing expenses and a third on child care. 9. Without financial aid, single mother students — a total of about 2 million — have little or no means to contribute financially to their educational expenses. 1. While there were less than 300,000 single father households in 1960, there were more than 2.6 million in 2011. In comparison, single mother households increased more than four times that many during that same time period, up from 1.9 million in 1960 to 8.6 million in 2011. 2. Single father households differ from single mother households on several levels. For the most part, those headed by single fathers tend to be better off financially compared to those of single mothers. However, compared to men who remarry, single father households tend to younger, less educated and have lower incomes. 3. Pew’s analysis of Decennial Census and American Community Survey data found that a record eight percent of households with minor children in the U.S. are headed by a single father, up from just over one percent in 1960. 4. According to Pew Research Center, there has been a nine-fold increase in single father households since 1960. 5. Single fathers are more likely than single mothers to be living with a cohabiting partner (41 percent versus 16 percent). 6. Single fathers tend to have higher incomes and are far less likely to be living at or below the poverty line than single mothers. Still, they fare much worse than married men. Statistics show that men who become fathers outside of marriage are more likely to be poor. These men were 70 to 90 percent more likely to be poor compared to men who never had children before marriage. For those living with father only, about 21 percent live in poverty. 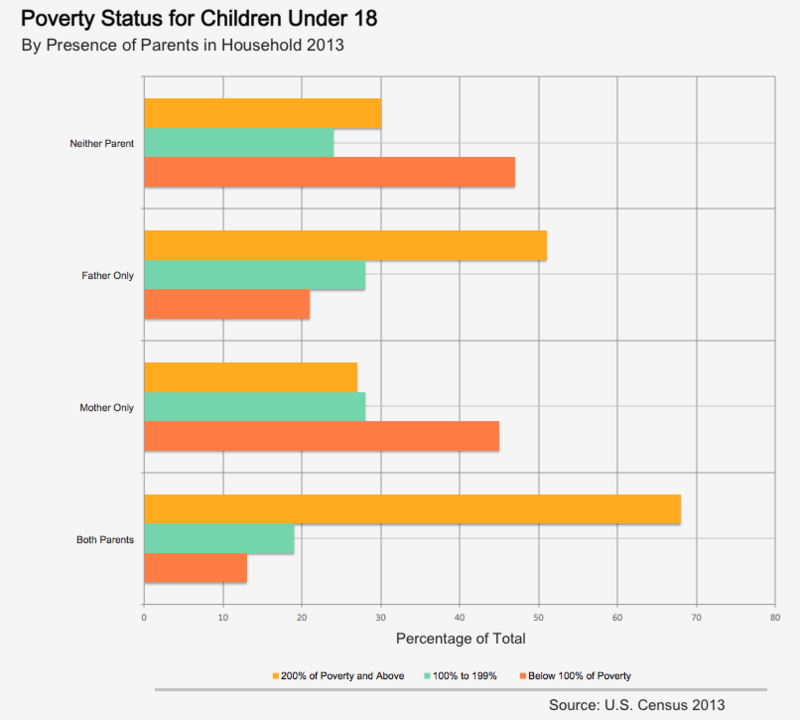 In contrast, among children living with both parents, only 13 percent are counted as poor. Despite the overwhelming benefits of two parent homes, the ‘stay together for the kids’ axiom isn’t always the right one. In fact, children are not always better off if their parents are married and living in the same home – especially if their parents are in a high conflict relationship. High conflict relationships can have disastrous effects on children, especially in children’s attitudes and feelings about themselves (something that studies have shown not to be affected by living arrangement). Staying in an irretrievably broken marriage isn’t healthy for anyone, the parents or the children. However, if a marriage is fixable, weighing the benefits for children may make married parents think long and hard about starting over. At the same time, unmarried parents are not all that different from married ones in terms of behavior. Marriage doesn’t make anyone a better parent, it simple allows access to more resources and opportunities for children overall.